Since people are still showing interest in the facebook autolike script, and it’s once again broken – I decided to release an executable version. Not many changes have been made (overall 5 lines, duh), but this time it should be much easier to use. IE. can this scripts graps 10 accounts and LIKE one photo fast? I’m afraid you’d have to make some changes. Hello robus. erm hey i am experiencing this. Note: Your language needs to be set to english. Also, it won’t throw an error if the password is incorrect, so check twice! err i did set the language to english (US) and english (UK), both still show the same result. so err what might be the problem here? 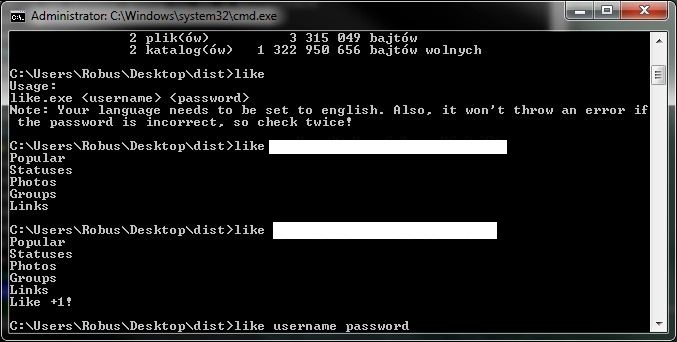 well i did try that too, but the cmd.exe just blinked itseld and then nothing happened. anyway. i got it now. but erm how can i make just to like statuses?